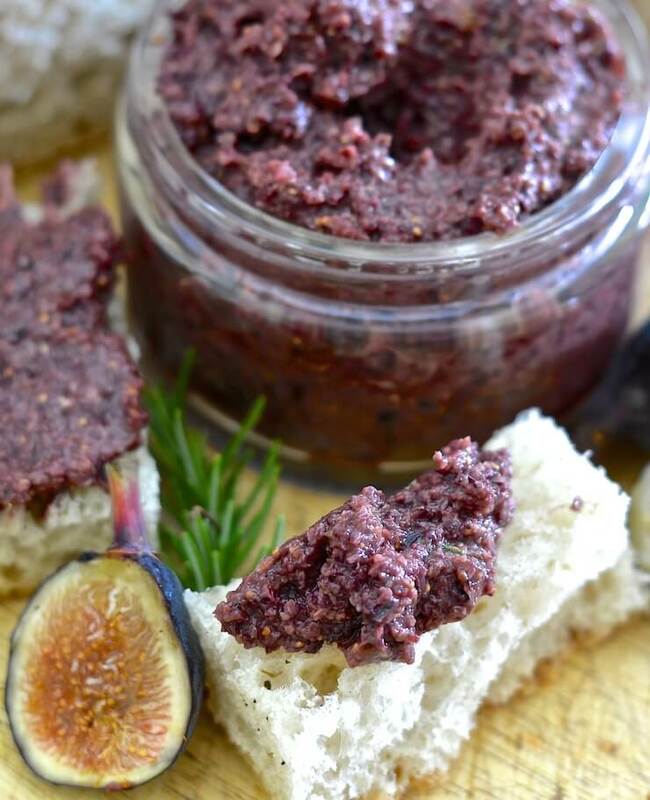 This rich, soft Fig and Black Olive Tapenade with Rosemary is my twist on traditional tapenade. Dark, deep & earthy olives are blended with ripe, plump & juicy figs to make an irresistibly delicious spread with a striking balance of sweet & savoury flavours. The inspiration for this recipe came from a local cafe called Pure Vanilla, the same cafe that the inspiration for my Raspberry Walnut Squares came from. We went there for lunch a few weeks ago and I ordered the Mezze Plate. The tapenade totally took me by surprise when I tried it. It was so incredibly delicious and had a flavour that I just couldn’t put my finger on. When I finished eating I was so curious that I had to go check the menu again. It turns out that it had figs in it. As soon as we left I went on a fig hunt. 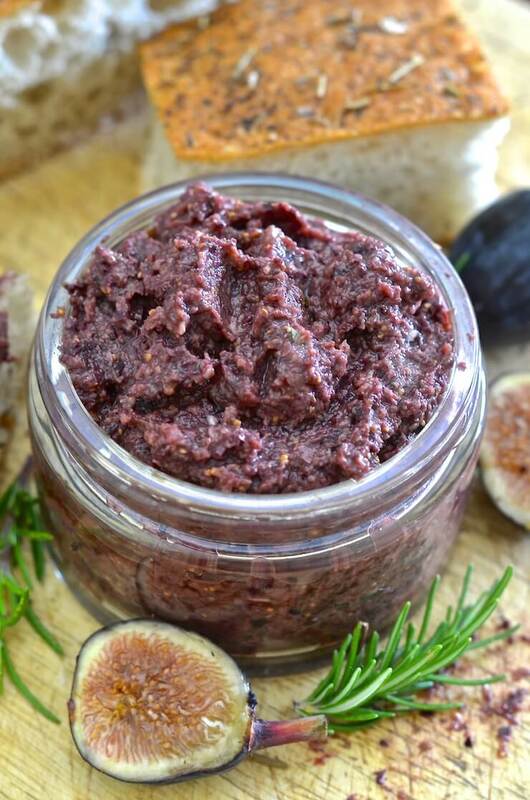 I needed to recreate it stat and within an hour of returning home I had myself a lovely pot of beautiful, rich, soft Fig and Black Olive Tapenade with Rosemary. It was so good I ended up eating a lot of it straight from the food processor when I was decanting it. Mine tastes a little different to theirs but in a good way. 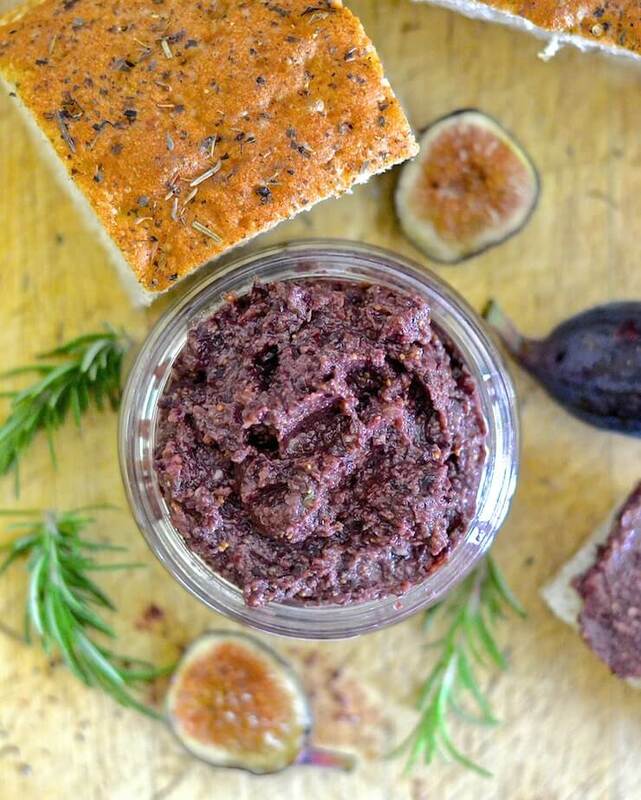 The flavours in this Fig and Black Olive Tapenade are complex but mind blowingly delicious . The combination of deep, earthy black olives and sweet, ripe, roasted plump figs is a taste sensation and the addition of a little fresh and fragrant rosemary gives it an added pop. It makes a lovely change to standard tapenade and is great for people who tend to find the regular kind a little strong and olivey. With fresh crusty bread. It is particularly good with ciabatta, foccacia, baguette or pita bread. 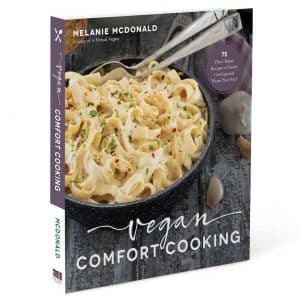 As a dip with pita chips, crackers, bread sticks or chopped vegetables. 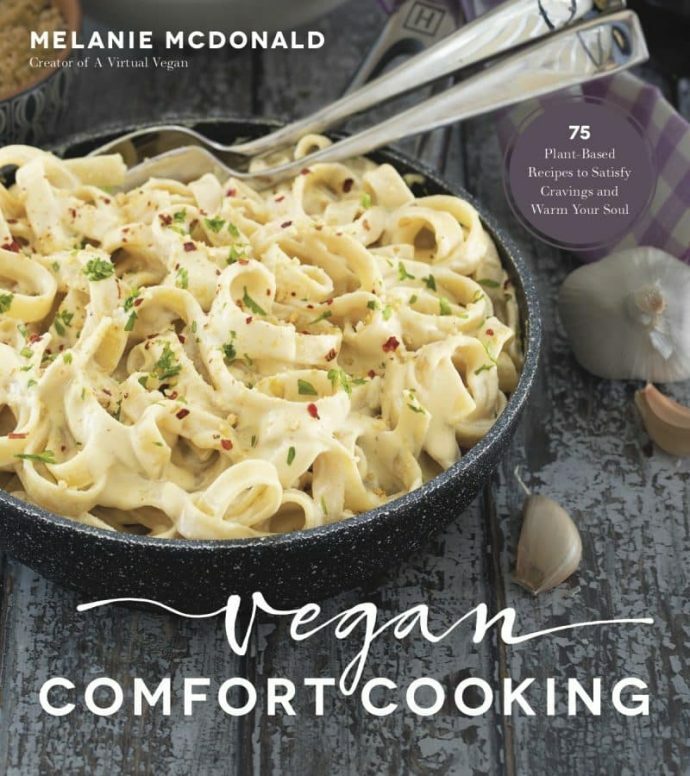 As part of a platter with all of the above plus some good vegan cheese and a plentiful supply of red wine (great for parties and get togethers). Cut the stems off the figs and place on a baking sheet. Cook in the oven for 20 minutes. If using dried figs put them in a bowl and cover with boiling water to soften them up. Drain after about 15 minutes. Add all of the ingredients including the figs, to a food processor and process until well combined. Will keep in a sealed container in the fridge for about a week. Dried rosemary is ok to use but is a little harder and more brittle than fresh so you might notice little hard bits in the finished tapenade. Rosemary is one of my favorite spices! So good and flavorful Looks like a perfect pre dinner snack! Oh my husband would LOVE this. He really likes olives and I know he would really like the fig in it too. This seems like such a sophisticated spread/dip. This would be such a great appetizer/snack to make when company is coming. As I read that you had inspiration from something I’m realizing I saw something a few days ago that inspired me as well and it has completely fallen out of my head. I should start making things that inspire me right away! It does seem sophisticated but it’s so simple to make and it’s perfect for when you have company. As for inspiration,it happens all the time. I can’t often make a recipe right away though. I was lucky this time as it was a weekend. I have an app called Wunderlist on my phone (it’s a free app) and I immediately make a note of my idea there. Otherwise I would completely forget about it! 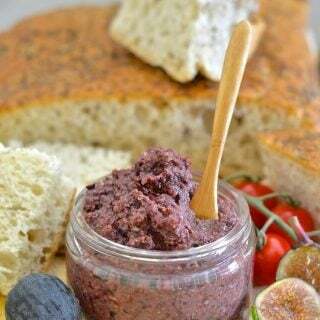 I don’t think I’ve ever even eaten olive tapenade but I love olives, so I bet I would love this! I love the addition of rosemary too, it’s one of my favorite herbs. What a wonderful seasonal recipe! I love olives, so I will definitely give this recipe a try! thoughts on adding honey to sweeten it a bit? You really don’t need anything to sweeten it. 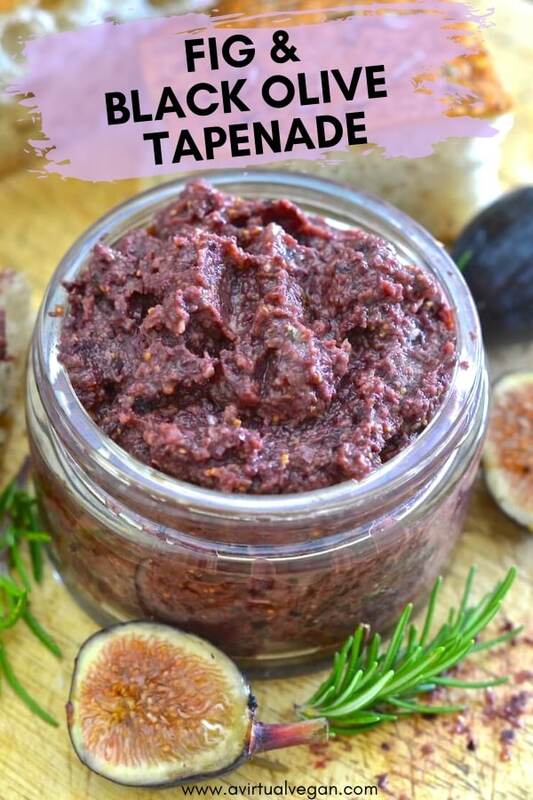 It’s a really sweet tapenade because of the figs. If you make it you will see what I mean. That restaurant sounds fabulous! These rich flavors have impressive party spread written all over them. I have to bust this out over the holidays! It is perfect for parties. I will certainly be busting it out too over thanksgiving and New year! Yum, I love fresh figs. This sounds so perfect and I’d love it on top of a wedge of Kite Hill soft cheese. I like your thinking! Roll on the opening of the Whole Foods here in a couple of months then I can try this Kite Hill Cheese that everyone raves about! This looks a fun recipe to make for fall parties and gatherings! 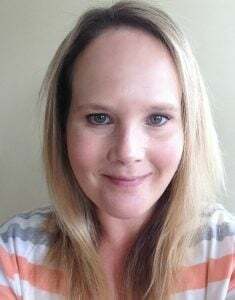 It’s absolutely perfect for parties and get togethers! Made it from figs growing in my garden:) wow great timing:) So good! Lucky you having them grow in your garden. I would love a fig tree! Oh, my gosh. I would be all over this tapenade. Every year when figs come into season, I throw a small celebration. They are my all-time favorite fruit, and their season is way too short. This sounds like the perfect way to celebrate it! Thanks so much Aimee. It did turn out a very pretty colour. It matches the colour scheme of my website which really wasn’t intentional! That is an interesting combination but I’d love to try it! Thanks Rebecca! I am a bit of a fig addict too! This looks so good! I love sweet and savory together.